We Started Here is ioby’s multimedia storytelling series exploring the work of neighborhood leaders across the country. Video and photography by Dan Lane and Erin Moore of GoodEye Video. Written by Tobin Hack. When Justin Moore thinks of his grandfather, he sees him hard at work on a “project,” pouring and forming concrete in the driveway or repairing a fence. Never sitting still. He sees his grandfather, nicknamed “Speedy,” teaching kids – not just his own grandkids, but whoever would come around and listen – how to do a thing well. “He was always teaching people how to do something right,” Justin says. Doing a thing right meant quality, and investing in the long term, and making sure you wouldn’t find yourself having to make repairs in a month’s time. Doing a thing right meant ensuring that the future would not inherit your mistakes or oversights. Justin’s grandfather Mr. Robert Leslie Edwards, was a sort of neighborhood patriarch, and one of the first Black residents in the inner-city Falls Creek section of Indianapolis, then a predominantly white neighborhood. He was a man of character, as they say, and he wasn’t alone. When Justin thinks of his grandfather, he also, invariably, sees at his side Mr. Mote – a “block captain” who often rallied the community for alley cleanups and other joint efforts, convincing you that picking up the neighborhood’s trash was precisely what you wanted to be doing on your Saturday afternoon. Mr. Mote, still alive today, was another neighborhood patriarch, and a white counterpart of sorts to Justin’s grandfather. Both men were WWII veterans. Both were small in stature. Both were can-do figures who meant business, and loved their town fiercely. So when Justin came along in the late 1970s, the baby of a family headed by his well-educated, working-class mother and father, he was born into a long tradition of working in the community. 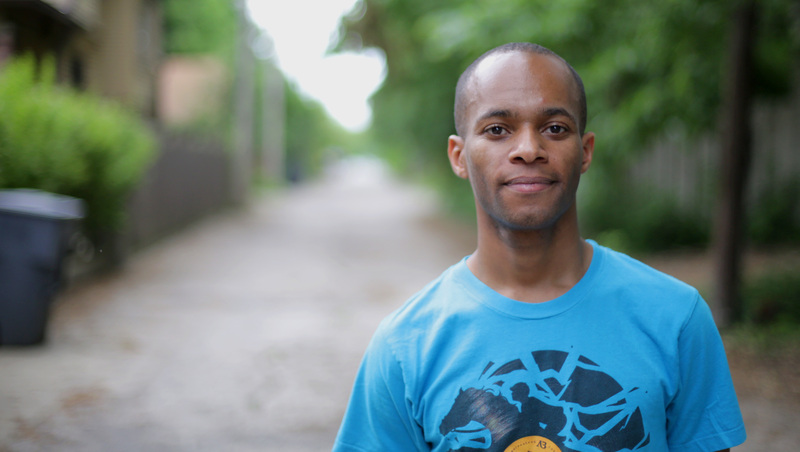 He grew up steeped in it, his parents’ dedication to the inner city neighborhoods they grew up in – Mapleton Fall Creek and Meridian Kessler – so great that even when the neighborhoods took a turn in the mid-1990s, falling prey to disinvestment, gun violence, drugs, and mandatory busing, they stayed. It got so bad that at one point the house on one side of the Moores’ home was abandoned, and the house on the other side taken over by leaders of a massive drug ring. When the inevitable bust finally happened, it was major. Justin remembers 20 police cars outside, and helicopters circling overhead. “I remember thinking, ok, we’ve got to get out of here,” he says. Even friends gave Justin’s parents flak for staying in harm’s way. Justin’s older brother, Jason, an honor-roll student and model of teenage responsibility, was at one point stopped and harassed by the police. It was too much, said the Moores’ friends. If you could afford to leave, they argued, then you had no business staying. These words fell on deaf ears. “My mom would always say, ‘well, that’s the problem! People leave instead of staying and making things better!’ They definitely were people who thought it was important to stay and remain a part of your community,” says Justin. It’s the sort of work a person couldn’t do remotely, no matter how much they cared. Joyce has been known to break up fights between adolescent girls, for example. “One of the parents cussed me out,” she says, “but the fight was stopped, and later on they would call and apologize.” She’s been known to teach neighborhood kids to stop making fun of – and finally, respect and appreciate – a local man (nicknamed “Radio Raheem” by Joyce, after a character in Spike Lee’s 1989 classic, Do The Right Thing) who’s mentally handicapped and often stands on a corner, dancing and singing to songs on his radio. She once politely confronted a neighbor about a stolen mini-bike, and got it back within days – no authorities involved. And so, through it all, the Moores have stayed, building a marriage of sort with their neighborhood. Through it all, their door remained open, unlocked. “They’ve never been robbed,” says Justin. “They’ve never had a problem, because they’re who they are in the community.” Meanwhile, gunshots rang out. Drugs took their toll. Beautiful old historic houses went to ruin. “My mom would always joke,” remembers Justin, “and say ‘you’ll see, they will all come back. It’s a matter of time that the neighborhood will turn around’.” She’s waiting still, firm as ever, and not passively, either. 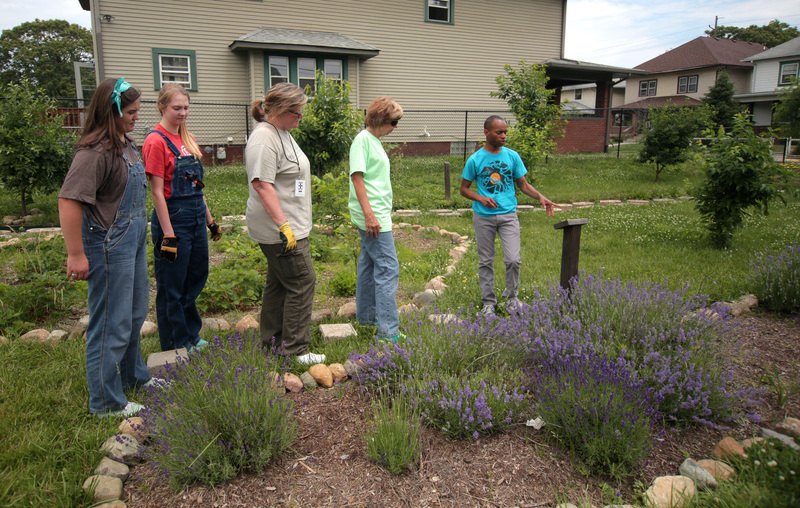 Today, the family runs an organization called Urban Patch, a social enterprise that uses a “past forward” approach to bring yesterday’s rich history and Greatest Generation ideals into the future of the American inner city community, through urban gardening, housing preservation, food justice work, education, strides toward green infrastructure, and more. 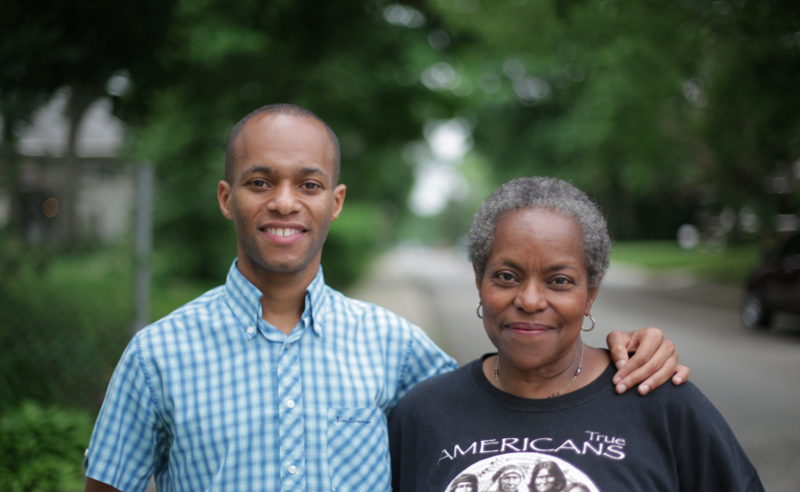 It would be impossible to separate the roots put down by Justin’s grandfather from the later flowering of Justin’s parents’ activism in the neighborhood – the two are part of the same organism – but the external trigger that Justin remembers as first drawing his parents into true activism was the slew of injustices poisoning the Indy school system when he was a boy. “A polite way to say it,” explains Justin, “is that there’s a battle for the inner city going on.” It started when the Moores – along with many other Black families who lived in Mapleton-Fall Creek and Meridian Kessler – were told that, as part of a larger reorganization of the busing and school systems, they would no longer walk the five minutes to their longtime local schools, (Shortridge High School and School #60 and School #66), but instead be bused upwards of forty-five minutes to various schools on the outskirts of the city. Justin was young, but he remembers the toll it took on his older brother, who suddenly found himself spending a good portion of the day being trucked out to an inferior school. Quality of life and quality of education shot, in one fell swoop. 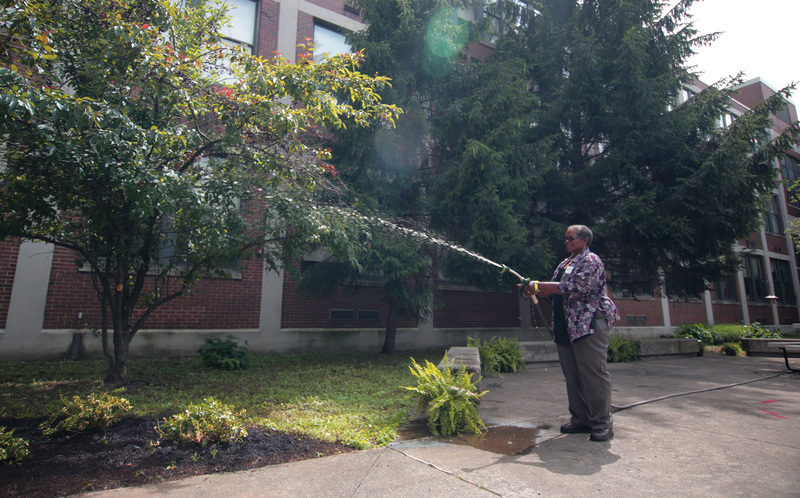 It was outrageous, but most locals – who for years had known Shortridge as the cornerstone of their walking community – didn’t know they had a right to stand up for themselves. It was, as Justin explains, part of a long and duplicitous history of northern American cities actively directing resources away from Black inner-city communities. The Moores, naturally, did not sit and take it. They jumped in and got involved. Joyce called neighborhood association meetings. Justin’s dad, a computer programmer, ran analytics on the system’s finances, exposing lies about where money was really going, and why. The battle is ongoing; Justin, now an urban planner and Columbia University professor, recently visited his old School #60, and was shocked to note that though the neighborhood is still largely Black, the student population is today overwhelmingly white. 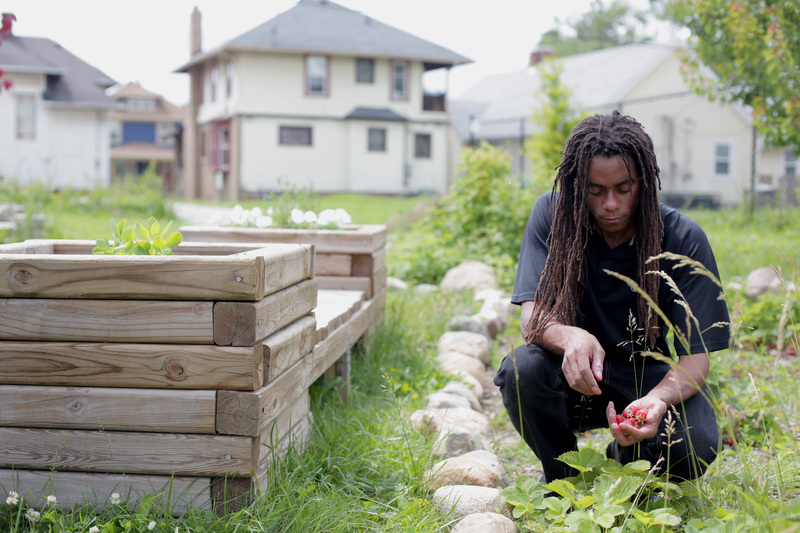 Urban Patch also takes on issues around food scarcity; grocery stores within walking distance of the neighborhood have been closing, even as Shortridge School undergoes an expensive and highly segregating makeover, and longtime residents are being left in the lurch. In June of 2015, the last of the neighborhood’s few mediocre grocery stores closed. Bus lines had been eliminated, young families with kids had moved out. Neighborhood disinvestment had continued to effect yet another instance of the terrible, slow erosion that has claimed so many American inner-city, minority communities. It was a final straw, not just for Joyce, but for many who attended the emergency meeting she called, in partnership with local churches. Joyce’s response to the crisis, as always, has been as organized and rigorous as it is passionate. Get her talking about the Oasis Project she and Justin announced soon after the recent closings; and she’ll keep the conversation right on track until she’s sure you’re crystal clear as to what her short, mid, and long-term plans are (nutrition education, revamping local dollar stores, bringing in a bodega and food carts, and finally, a big grocery store or co-op) for bringing healthy, accessible food back to the community she loves so fiercely. Lots of locals are involved in the food security issue, but Joyce is the only one who’s been to most of the meetings so far. She’s the glue, keeping everyone in touch and up to date. Even local farmers, one of whom told Joyce that he’s forced to discard 40% of what he grows. As Joyce explains, “there’s a lot of stuff that’s absolutely nutritious and good, but the tomato might not be round, or the cucumber may be undersized. We’re trying to create a market for these farmers.” Safe to say that she won’t rest until all those lovely, asymmetrical fruits and veggies are making their way onto the plates of her neighbors. How many neighbors does it take to paint three gigantic sunflowers? If you ask Justin which, of all of Urban Patch’s projects, is his favorite, he’ll answer without hesitation. 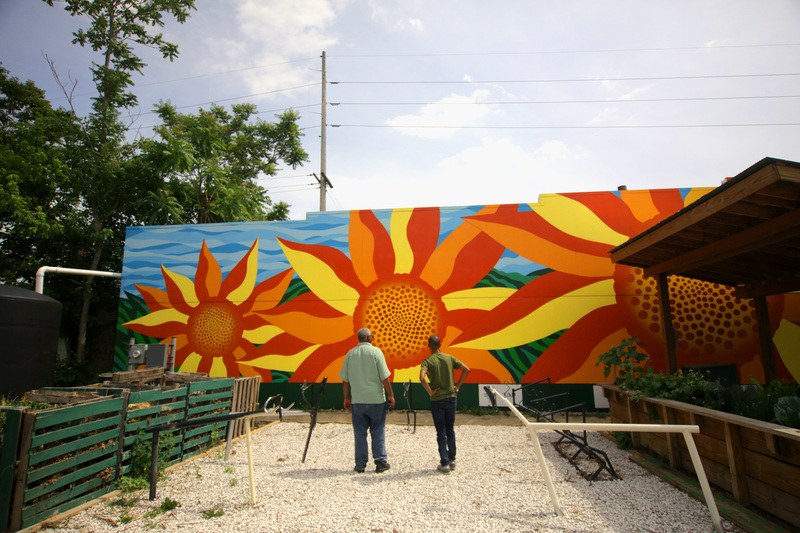 It’s the big, gorgeous sunflower mural that his family helped to bring to Fall Creek Gardens – a green space initiated by the Mapleton-Fall Creek Development Corporation as a part of their 20/21 Vision Plan and LEED ND designation, where all sorts of canning classes and stone soup events were already happening. Justin loves the mural for the big, bright, inclusive way that it brought everyone in the neighborhood together, from the 100 people who voted on the design to the Shortridge School art teachers and students who helped out, to his own brother, John, the artist who created the mural. It was all hands on deck. “I think that was a project where, to the best degree we kind of used everyone’s talents and creativity in a way that everyone in the community got to be a part of it very directly. Everyone loves that mural,” Justin says proudly. “I mean everyone loves that mural.” It’s a perfect example, for him, of how creative, deliberate, inclusive placemaking can absolutely change the way a neighborhood feels to the people who live there, and make it home. Incidentally, did you know that sunflowers, as well as being symbols of cheer and joy, are incredibly powerful when it comes to removing toxins and heavy metals from contaminated soil, leaving it cleaner for future gardeners? Could they have chosen a more perfect metaphor? The Moores have stayed in place, but they haven’t stopped moving. And they’ve motivated many of their neighbors to join them in motion. “All hands on deck is something that needs to become a way of life over time and across generations in that neighborhood,” says Justin. One of the most exciting moves toward that goal that Urban Patch has in the works at the moment is the Redbud Project: an annual Indiana Redbud tree festival (hundreds of trees have been planted, hundreds more on the way) that they hope will bring the neighborhood into full and vibrant bloom. Justin wants to see it become the kind of festival that people from Indy and even beyond put onto their calendars every year. The kind of thing you plan to see every spring. The kind of thing you plan to bring your mother to. The kind of thing that redefines a neighborhood, not rewriting the story – not trying to undo what’s been done – but adding a new, beautiful chapter. What’s the motivation? It must be said that there is a degree to which the Moores are motivated by fear of the new inequalities gentrification often brings with it. Fear that the neighborhood will be made “better,” but that its most vulnerable residents will be displaced. “Our big fear,” says Justin, with an unmistakable note of grief in his voice, “is that the neighborhood becomes a place that is not for everyone.” It’s not, as he points out, an unfounded fear, but he and his family are letting it motivate rather than paralyze them. Case in point: the next trick Joyce has up her sleeves is a deceptively simple idea. This summer, she hopes to bring the neighborhood together to have what she calls a “conversation people in this country don’t want to have.” That is, a conversation about race. She’s a member of a Jewish and Black women’s group, and hopes to bring their open, communication-driven ethos to the larger community. Everyone will be invited, all comments will be heard, and no one will be shamed. How is Joyce going to keep the space so safe? “We’re gonna do it over food!” she explains. “People love to eat. It’ll be food and art, because those are two things that can open a conversation.” Crazy ideas, surely, will be aired. Prejudiced ideas. Unfair ideas. Loving ideas. Innovative ideas. Get it all out there, says Joyce, and then move on from there. It’s about doing a thing right, just as Justin’s grandfather always taught. Doing it the hard, right way, for the long term. Trusting that the future will prove worthy of one’s best efforts. 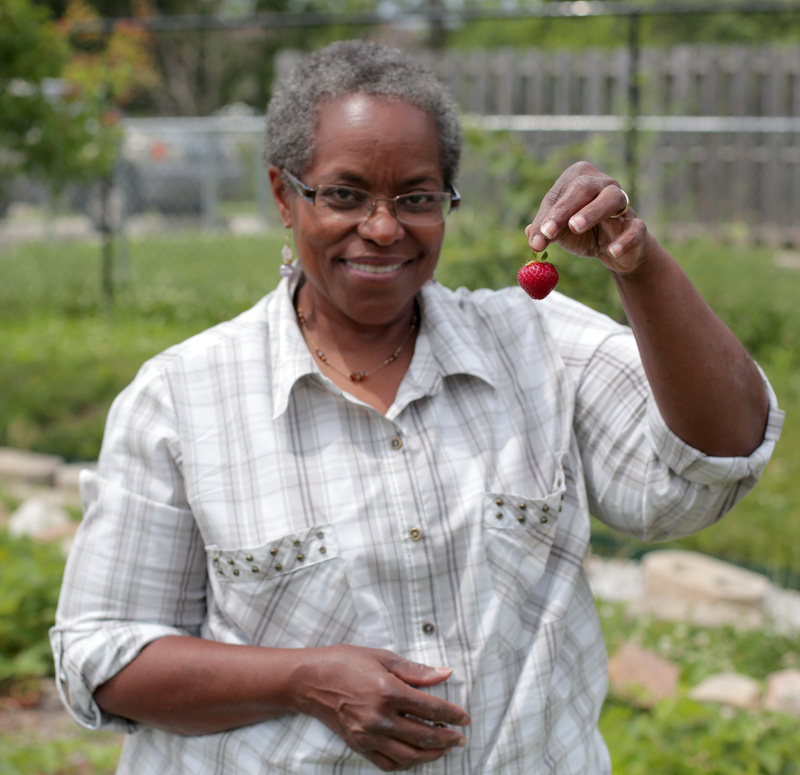 If Joyce could snap her fingers and create her ideal situation in Indy, what would it be? “That would be for the city to create microloans for entrepreneurs to start their own businesses in the community, at a low interest rate, with some kind of support to make sure they’re successful. And to get back to being able to walk to neighborhood schools.” She wants to see neighbors getting to know, depend on, and support each other, to the extent that they did when she was a girl. She wants to buy her groceries from a local entrepreneur, and say hello, from her porch, to children walking to school. Our grandmothers knew the name of every family on their block. If there was a busted fence they fixed it. If there was a neighborhood meeting they showed up. They belonged to the place where they lived and the people who lived right next door. There’s was a connection we all seem to remember, but one we struggle to locate in cities we now find ourselves. Our neighborhood is too often just the place we pass each other on the way to work. 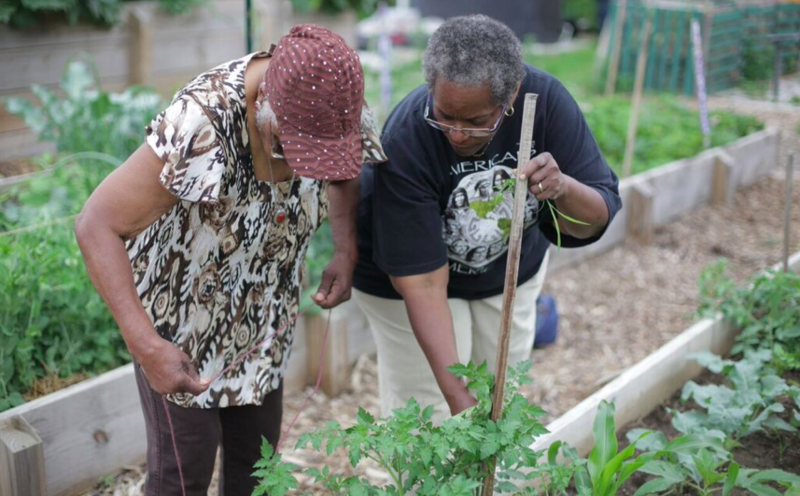 This project is an expedition to find out why community engagement disappeared and how neighbors in cities across the country are now getting together to reimagine America, one block at a time. These are tales of everyday people who decided to start where they live, with their own ideas for making things better. We tell the stories of bike lanes, community gardens and time banks… of small business people, activists and lifetime locals. This is an experiment, to see what happens when a community of people doing awesome things gets the chance to share their own solutions and dreams. Using video and pictures and paint and words, we’re bringing to life movements in urban neighborhoods from Buffalo to Memphis to Dallas.